Back when I relaunched my website in September 2012, the slogan ‘get gutsy’ was a blip on the radar. In fact, in this entire post detailing my rebranding and web design process, not once do I mention the phrase, get gutsy. But now? Get Gutsy has become my entire brand, my mantra and the way I strive to live my life. Here’s the story (a marketer’s dream come true, really) of how my online community helped define my brand and name my blog. 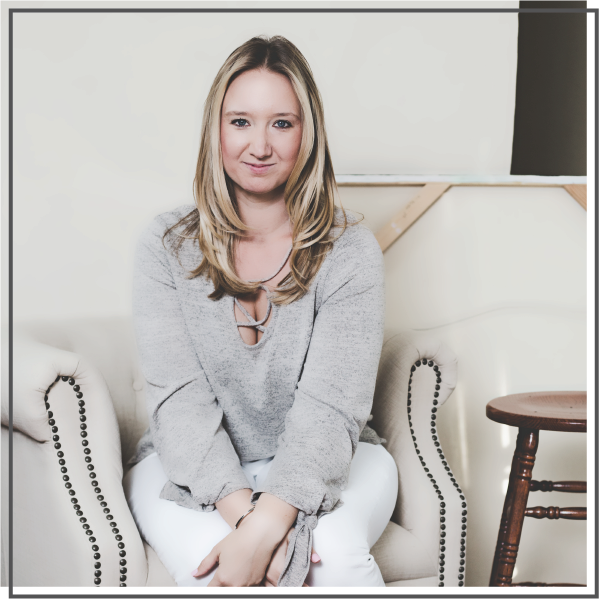 When I set out to rebrand and relaunch my blog, I had one goal in mind: to keep my site general enough that it kept my interest (I had lost interest in my previous book review blog months before), but specific enough that it attracted a certain type of reader. Simply put, this has worked well for me, which is why I always recommend a general approach to blogging over niche blogging. I struggled with selecting a blog name, so I took the “lazy” route and selected my name ‘Jessica Lawlor’ as the blog name, URL and header image. (I say lazy because it’s an easy option, but that doesn’t mean it’s not a smart option-it has been excellent for personal branding purposes). After my web designer and I had settled on a design, it came time to write the pages for the main navigation of my blog. Ashley, my designer had recommended I have six tabs across the top of my blog and in coming up with the pages “meet Jessica,” “portfolio,” “work with me,” etc. I realized I had an extra tab and wasn’t sure what to do with it. As I thought more about the quote I had selected for my tagline, I knew that through my blog, I wanted to incorporate other people’s stories of stepping outside of their comfort zone. I needed a way to define that. To discover that definition, I came up with a list of words that described getting out of a comfort zone. The words bold and gutsy topped that list. Immediately, “get gutsy” resonated with me and I emailed Ashley to let her know that I wanted “Get Gutsy” to be the name of that sixth tab on my site. It would be a place where I could share the ways I was getting out of my comfort zone and also the ways my readers stepped outside of theirs. 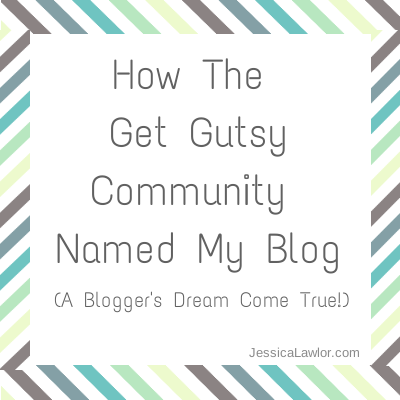 After the site launched, I started using the hashtag #GetGutsy when promoting my blog posts on social media. There was no real strategy behind using that hashtag; I just thought it might be a good idea to have a place where I could share all my posts and perhaps have more people stumble upon it. I had no idea at the time that I was beginning to build a community. I featured a couple of reader Get Gutsy guest posts on my site and encouraged others to share their story. I collected email addresses for my Get Gutsy email list (but didn’t start sending out regular newsletters until months later). It took on a life of its own! That’s when I knew something big was happening. Something beyond my control. Something amazing. I realized that: my readers essentially named my blog. They had defined my brand. They helped me put into words something that I had previously only felt, but hadn’t yet been able to express. To me, this is the ultimate compliment. Because it’s 100 percent authentic. What better way to see if something is resonating with your community than by having them essentially name your blog and shape its direction?! All of this confirms to me that my blog/brand are going exactly where I want them to go. The Get Gutsy brand is growing WITH my readers. And that’s important. Once I realized that Get Gutsy had caught on, I started incorporating it more strategically into my blog and future plans. In December and January, I hosted Get Gutsy Week and the #GetGutsy essay contest, which nearly 30 of you participated in. There are plans on the horizon for a Get Gutsy ebook and Twitter chat. A video series and maybe a podcast. More to come…and of course, I want to hear what you think and what you’d like to see in the future. Oh and guess what? You may not have even noticed, but Get Gutsy is actually still not currently part of my blog’s header or the overall design. That will be changing in the near future, but I think it’s a bit of a fun fact that the “name” of my blog isn’t currently included in my design, but has still managed to resonate. Get started. I mentioned above that I took the ‘lazy way out’ when it came to naming my blog. That’s because I knew I just wanted to get started. If I didn’t launch them, I would have spent weeks and maybe even months agonizing over a blog name. Instead, I figured out a temporary solution and trusted that my blog would grow and develop on its own. Listen to your community. My readers are among some of the most amazing people I’ve ever had the opportunity to get to know. I am grateful for them every single day (THANK YOU!) They are the reason I continue to put my heart and soul into this blog. I ask questions and listen carefully to their feedback in emails, blog comments and tweets. One of my biggest tips for blog success is to get your community tell you what they want. Allow your blog/brand to develop over time. Believe me, all of this did not happen overnight. It’s only in recent months that I’ve thought to myself, “Whoa, this is getting big.” Let your blog grow organically and authentically. Don’t force it. If you write consistent content, promote your work and interact with your community, your blog *will* grow, I promise you that. Have you ever rebranded a website or launched a new community? How did it go? I’d love to hear your stories and tips!